• No fixed fee. Only a donation to AAII required (100% goes to AAII). • $149 by Nov. 15, $199 after Nov. 15. • No-host lunch at Woods Café, Whole Foods, and other adjacent restaurants. WHAT’S THE DIFFERENCE BETWEEN THE TWO SEMINARS? You will learn a lot at the Part 1 Seminar, but you will learn everything about how to make your portfolio muscular at the Part 2 In-Depth Seminar. The seminars are self-contained — you will benefit by attending either one — but you will learn the most by attending both. For decades, the financial services industry has sold risky investments, claiming that greater risk was the only path to greater gains. But high-risk strategies are vulnerable to huge losses that can devastate your portfolio. Today, there’s a better approach. 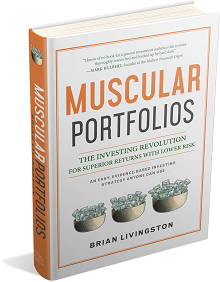 Brian Livingston’s new book “Muscular Portfolios” reveals the latest scientific evidence behind what experts call the Index Investing Revolution. In addition, MuscularPortfolios.com is the first website to give away Wall Street’s secret buy-and-sell orders of low-cost index funds. Email us at least 24 hours before the event, and you will receive a full refund. Which way will the S&P 500 go?